Feel the canvas like texture for a rush of opulence, perfect for any season. 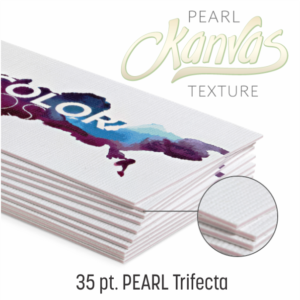 The 650 gsm Kanvas paper owes its high quality look and feel to its “Solar White” surface that is lined between a Pearl core. The best way to make your prints so palpable that the impression they leave will be everlasting. It’s time your designs reached a new level of grandiose by printing them onto our 35 pt. thick paper stock, topped with an exquisite tactile finish. With an impressive thickness and tangible, velvety texture on the surface, the 38pt. 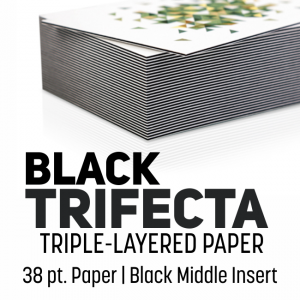 Trifecta black Triple-Layered Ultimate is a card stock that looks and feels incredible. Printed on 700 gsm “Smart White” paper with a black middle layer that is thicker than the two white layers, this paper stock is designed to provide depth and a unique appearance. These cards have a Velvet Finish to give them a nice textured feel. It’s simply the perfect tool for when you want to be unforgettable. What better way is there to be front and center, than with a set of stunning 38pt. 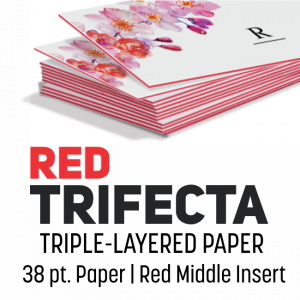 Trifecta Red Triple-Layered Ultimate cards. With a 38 point thickness (700 gsm), these ultra-thick cars have a striking red middle to set you apart from the crowd. Printed on “Smart White” paper, the red middle layer is thicker than the outer white layers, for a noticeable, bold appearance. These cards have a Velvet Finish to give them a nice textured feel. The result is a potent tool that us to sure start a conversation or two, anywhere you go. Triple-Layered Ultimate is a premium stock with a quality you can both see and feel. Printed on 520 gsm “Smart White” paper, a velvet finish is applied to the surface for a textured feel. 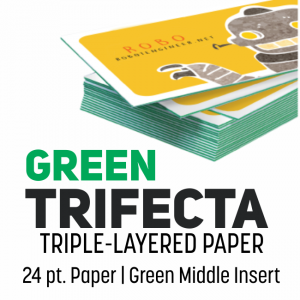 Thick and layered with a vivid green color in the middle, this is one card stock that will truly make you stand out.